The Chevrolet SS was never a best seller. It was barely a seller at all. But it had the deep, niche, Australian roots that could make any car enthusiast smile to see it in NASCAR’s top level. The SS’ production and racing death at the end of 2017 will be a sad time fo... wait, hold up, that Camaro ZL1 is its replacement? Damn. Chevy might have been terrible at marketing the SS, but this sure eased the pain a little bit. The ZL1 will replace the SS at the start of the 2018 season, since there’s no need from a #branding standpoint to race cars that you no longer sell. 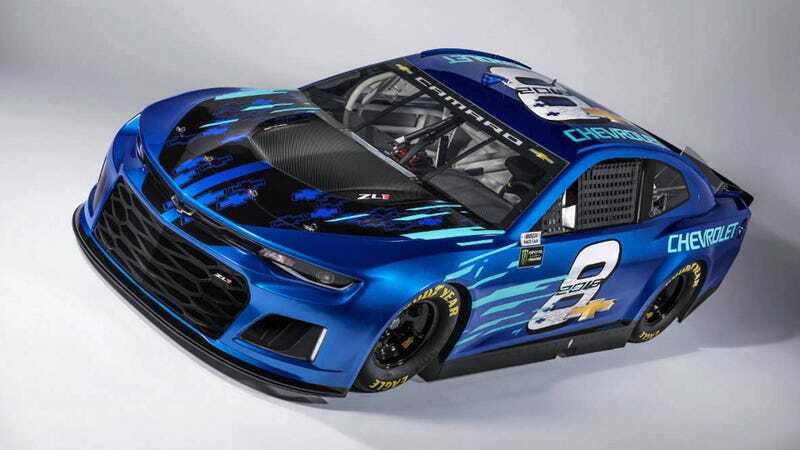 It’ll compete for the first time in the season-opening Speedweeks at Daytona International Speedway, and will be the second Camaro in NASCAR’s top-three national series—the Camaro SS has been in the second-tier Xfinity Series since 2013. NASCAR’s announcement on the new car said engineers “optimize[d] aerodynamic performance while maintaining the ZL1’s design character,” which makes this sound like the final product and is kind of amazing—the nose on this thing, while incredibly attractive, looks like it would eat air for breakfast rather than provide a lot of downforce. Either way, it’s about the best realistic replacement Chevy could have chosen for the SS in a series that runs stock—yes, “stock,” since you’re all going to say it in the comments anyway—cars. But even with the pain eased, it’ll be sad to see the SS go. The SS was the American, Chevy-badged Holden Commodore, the rear-wheel-drive V8 sedan we all wanted but had to simply be jealous of the Australians over for a long time. The car finally came to the U.S. for the 2014 model year. When it came to America, though, Chevy didn’t quite market it to the enthusiasts would would care enough to buy it. It started with an automatic transmission as its only option, and got the manual the next year when Chevy evidently had its “d’oh” moment. It became Chevrolet’s NASCAR entry, and it was always the fun little oddball. Sadly, we only have a few more months with it there. The SS is getting the boot alongside General Motors’ beloved Holden brand in Australia, rendering it irrelevant from a marketing standpoint on the race track. But the replacement isn’t too terrible on the eyes, if we’re honest. Rest in peace, our dear, American Holden Commodore that never quite got the love it deserved. At least you didn’t get replaced by an Impala.